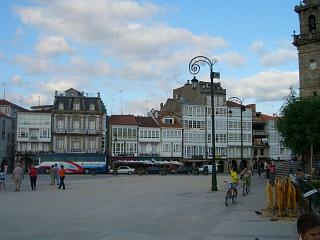 Here is a first hand description of Betanzos by Maria Lamas who has a family connection with the town and visits it regularly (it has been slightly edited). Many thanks to Maria for writing to us. I do not know much about Betanzos' history, other than that it was an important Roman stronghold built on a hill and with an old town surrounded by a large roman wall which encircles the town. There are lots of old churches dating back to the Roman era and most of these are in very good condition. There is also an old Carmelite nunnery which my mother can remember when it was still occupied and the nuns used to lower a basket down to be filled with provisions. I believe they had a vow of silence, hence the basket! The town holds a very large fiesta for "San Roque" on the 16th August, when lots of traditional activities take place and the day ends with the inflation and release of a large hot air balloon ("El Globo"). This balloon has cartoons drawn on it, mainly political and current affairs, and all very "tongue in cheek". In the place of a traditional basket there is a small boat and this contains fireworks which are set off when the balloon is high enough. There is also a very large and impressive fireworks display which begins on the release of the balloon. This is accompanied by lots of cheering, clapping, music and the obligatory church bells! The town also hosts "Os Caneiros" where boats, bedecked with banners and buntings, travel along the river to an spot which can only be described as a large picnic area. Here there are food and drink stalls and traditional dancing displays. During the day this event is mainly family orientated, but the evening is much more boisterous and this is when the adults come out "to play" and generally over eat and over drink! Both these events are well known and people come for miles to participate. 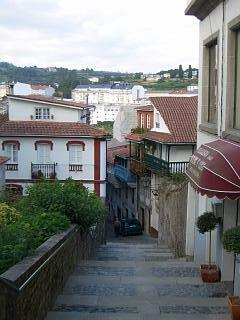 The region is also well known for its pulpo, market day and not forgetting the witches cauldrons! Franco also came to this area for his summer holidays and the country estate where he used to stay, on the outskirts of Betanzos, has recently been renovated and I believe that it is now open to visitors. Even though I have never been inside, it is on my list of "things to do" as it really is quite beautiful. There are also some old caves, which again have been recently renovated, which I think originally held some exotic animals (well exotic to them at the time!). These caves are supposedly well worth a visit. Further along the coast you come to a small village called Sada which was originally a fishing town. They hold a yearly "Sardinada" which is also very well known and people come for miles to join in, and yes, it is worth it. If you have not eaten sardines like this you really do not know what your missing. As Sada is in a sea inlet its beaches, and the surrounding beaches, are very safe and there are several which have attained a blue badge status. It is a very popular tourist area during the summer months and there are several camp sites and even a sea scouts centre which is visited by scouts from the world over. I notice that GaliciaGuide.com has not mentioned the traditional "caldo" which is made with potatoes, cabbage and pork, grillos (not sure if the spelling is right) made with turnip tops, or "roscones". Roscones are doughnut shaped "bread-like" sweet pastries, previously only available during fiestas when women would walk about with them in large baskets on their heads. The ruscones are slid onto reeds in long strings (it sounds weird, but if you see them you will know what I mean!). Also how about the traditional bread, again doughnut shaped and made with coarse ground flour and very rustic. This bread is pretty dense and heavy, but just right for dunking into sauces!